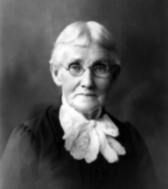 Mary Ann Bickerdyke was a remarkable woman who did not begin her nursing career until the second half of her life. She is considered by many to be one of the most famous nurses in history because of her humanitarian work during the Civil War. Not much is known about Mary's early life. She was born Mary Ann Ball on July 19, 1817, in Mount Vernon, Ohio. Both of her parents died shortly after her birth, and she was raised on a farm by grandparents and then by an aunt and uncle. She attended Oberlin College in Ohio, one of the few colleges open to women at that time, but it is not known if she graduated. Some sources say that she dropped out because of an epidemic that could have been the cholera outbreak in 1837. It also is suggested that following her time at Oberlin, she took a course in nursing instructed by a Dr. Reuben Mussey, head of Ohio Medical College. However, this has not been verified. At the age of 30, Mary Ann married Robert Bickerdyke, an English mechanic. They had two sons and a daughter who died in infancy. It is said that her daughter's death inspired Bickerdyke to study and learn more about health. Her husband died in 1859 after 12 years of marriage, leaving Mary Ann to support their family. She worked at various jobs. At that time, there were no formally trained nurses, so she very well may have taken nursing jobs as well as being a laundress and maid. Shortly after the outbreak of the Civil War, an event occurred that would change the life of Mary Bickerdyke forever. Her Congregationalist minister read a soldier's letter to the congregation that described the inferior medical care the wounded were receiving. Bickerdyke and the other church members were so moved by the letter that they collected supplies, and Mary was chosen to deliver them to the closest Union base in Cairo, Illinois. She left her sons in the care of friends and embarked on what she thought would be only a short journey. When Mary arrived at the base, she was so appalled by the conditions that she refused to leave. Without official permission, she began to clean wounds, improve sanitation and cook nutritious meals. She met with opposition, especially from officers and doctors, but continued her mission in a no-nonsense, pragmatic manner. She created a network of contacts for supplies and organized a group of volunteers who helped her improve the recovery rates and morale of the soldiers. With no patience for red tape and bureaucracy, her only thought was for the welfare of the wounded. She earned the title of "Cyclone in Calico" because of her disregard for regulations. Because of Mary's success with the camp, the army decided to build a permanent hospital in Cairo. However, she still had her opponents, mainly because she was a woman. News of her dilemma reached General Grant, and he appointed her matron of the hospital, giving her official status. As matron, she was in charge of not only nursing, but also cooking, cleaning and securing supplies. In 1862, she was appointed as a sanitary field agent. This gave her access to the U.S. Sanitary Commission stores and made acquiring supplies much easier for her. As the war continued, she gained the attention of Generals Grant and Sherman who allowed her to follow the army into battle. They trusted her so much that she was granted free access to the troops and the only woman to whom Sherman gave that privilege. As she ministered to the troops, she became known as Mother Bickerdyke. She could be stern and unyielding when dealing with opponents, but was a kind, mother figure to the wounded soldiers. While Bickerdyke traveled with the troops, she set up more than 300 field hospitals on 19 battlefields and improved conditions for the soldiers. If any of the staff complained about her methods, Generals Grant and Sherman supported her efforts. It is reported that Sherman once jokingly said that she outranked him. After the war ended, she was honored by being asked to ride at the head of the XV Corps in the Grand Review in Washington. She stayed on as an army nurse until she retired in March 1866. Even after her retirement, she worked on behalf of the veterans. She helped them as well as nurses obtain federal pensions. When she moved to Kansas to be with her sons, she helped many veterans secure land and tools so they could settle there also. Until the very end, she dedicated her life to improving conditions for veterans. After suffering a stroke, she died in 1901 at the age of 84. "Mother to the Boys in Blue" is engraved on her tombstone. Mary Ann Bickerdyke taught the world that it takes only one person to effect massive change. She elevated the value and importance of the nursing profession and fought for what was right in spite of many obstacles.